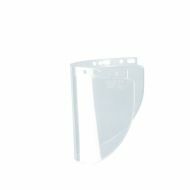 #S8500 Uvex Bionic® Shield by Honeywell. 100% dielectric. ANSI Z87.1. 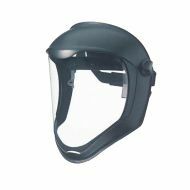 Includes #S8550 clear visor. F-300 Ratchet Headgear from Fibre-Metal® by Honeywell, 3" crown. Clear Visor #4118 sold separately. F-400 Ratchet Headgear from Fibre-Metal® by Honeywell, 4" crown. Clear Visor #4178 sold separately. 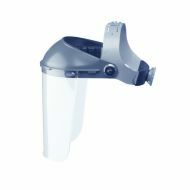 F-500 Ratchet Headgear from Fibre-Metal® by Honeywell, 7" crown. 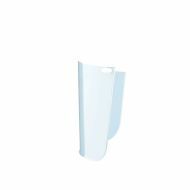 Clear Visor #4199 sold separately. 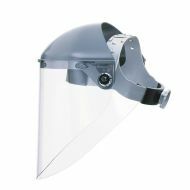 4118 CLR Clear Visor, standard size 8" x 11.25", for F-300 Head Gear. 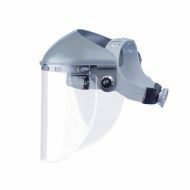 4178 CLR Clear Visor, wide vision wrap-around 8" x 16.5", for F-400 or F-500.